In a medium mixing bowl, combine all the ingredients for the filling and mix well. Pour into an 8x8 baking dish. In a separate mixing bowl, combine all of the ingredients for the topping, and mix with a fork until combined. Add additional oil or syrup if the mixture is too dry. 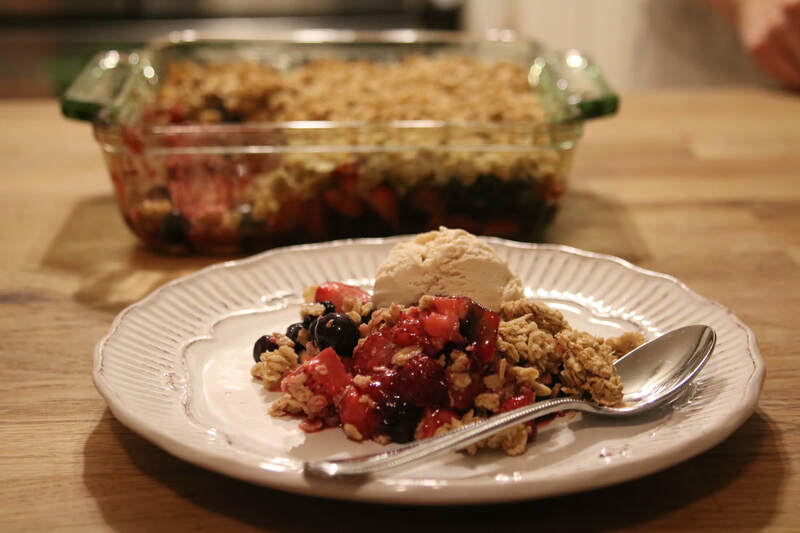 Crumble the topping on top of the fruit mixture. Bake at 375⁰ for 30 minutes. If a crisper topping is desired, finish under the broiler for 1 minute. Whisk together the mayonnaise, yogurt, hot sauce, lime juice, sugar, salt and cilantro. Toss with the cabbage, carrot, radish, peach, and red onion. Refrigerate. The flavors get even better the longer it marinates. ​ Serve cold. Bon Appetit! *You can skip the mayo and use 3 additional tablespoons of yogurt, which would decrease the calories per serving from 92 to 55, and decrease the fat per serving from 5g to 1g. I love this salad because it makes a great big portion, it’s good as a side or as a main dish, and it’s adaptable to whatever vegetables you may happen to have in your fridge. I’ve made this with zucchini, asparagus, corn, and cauliflower, and it comes out great every time. You can also change up the fruit to whatever is in season: cranberries in the fall or winter, apples or clementine’s year round, grapes or strawberries in the spring/summer…the options are endless! ​Great on its own as-is, or for lunch over arugula greens with an egg (poached, sunny side, hard-boiled...), or for dinner with a piece of fish. I bet it would be good stuffed in a Portobello mushroom too! Too many options! Bon Appetit. Lightly grease, or place a silicone mat, on a sheet pan. Place mushrooms, broccoli, and asparagus on the sheet pan and roast for 20-25 minutes, checking periodically. The mushrooms should be tender, and the broccoli and asparagus should be pierced easily with a fork. While the vegetables are roasting, combine the radish, carrots, celery, and shallots in a large mixing bowl. In the liquid measuring cup (or a small bowl), whisk together the dressing ingredients. Set aside. When the vegetables are done roasting, and when they are cool enough to handle, slice the mushrooms and chop broccoli and asparagus to desired size. Add to the bowl with the other vegetables. When the rice is done, let it cool slightly, and add it to the bowl of vegetables. Add the dressing while the rice is still warm (it will absorb the dressing nicely), and mix well. Add the grapes and almonds, mix well, taste, and adjust the seasonings/dressing. ​Place in the refrigerator to marinate for at least 2 hours. 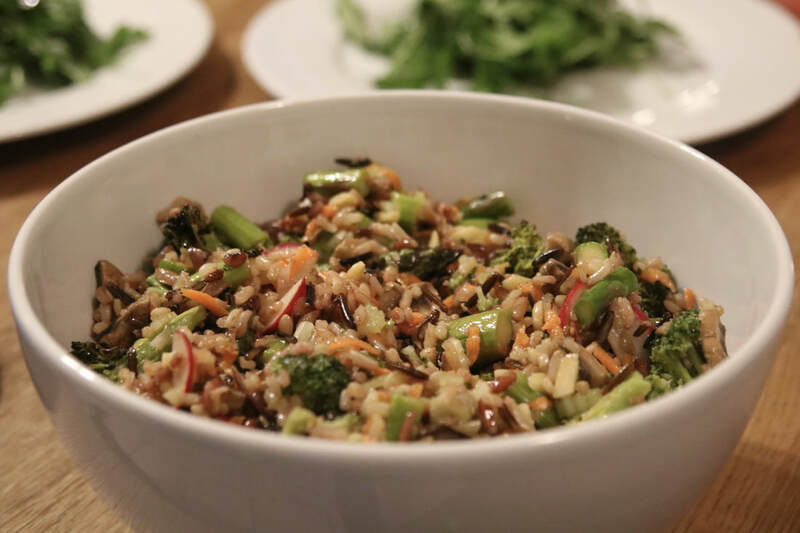 *Any whole grain will work nicely with this: farro, quinoa, brown rice, whole grain pasta, etc. Frozen vegetables are great to use not only when you’re running short on time or haven’t had time to grocery shop, they are also great when fresh vegetables are not in season. They are just as healthy as fresh vegetables, and there is no cleaning or chopping involved! Win, win. And the vegetable possibilities are endless! Use whatever vegetables your family enjoys the most. Play around with colors and textures too! If you don’t like quinoa, whole grain pasta, brown rice, or a wild rice blend can be used. Just remember to add on cooking time if you use rice. 1. Rinse and drain the quinoa in a fine mesh strainer. Add the quinoa to a sauce pan with 2 cups of water. Bring to a boil, cover and reduce heat to low, and let simmer for 12 minutes. 2. Combine spices and set aside. 3. Add vegetable broth to a large sauté pan or Dutch oven. Once heated, add frozen vegetables and spices. Mix well. Bring to a boil, cover and reduce heat to medium-low. Simmer 5 minutes. 4. Add tomato sauce, ricotta, and beans. Mix well. Simmer uncovered for an additional 5 minutes, stirring occasionally. 5. Once the quinoa has finished cooking, add it to the pot and mix well. 6. Taste and adjust seasonings as desired. Serve hot topped with sliced avocado and pine nuts. *Rinsing quinoa removes it’s natural coating, called saponin, which can make it taste bitter or soapy. *Rinsing and draining canned beans removes excess starch and salt. Healthy muffins that come together quickly, and can be eaten on the run. Great when you don’t have much time, and great if you do have time! These freeze wonderfully too, so they are a great addition to add to your meal prep for the week. 1. Preheat oven to 375 degrees. Lightly grease a 12 cup muffin pan with cooking spray or oil. 2. Mash the bananas in a medium mixing bowl. Add the milk, eggs, vanilla, and syrup (if using), and whisk until combined. 3. Add the dry ingredients, and mix until combined. 5. Fill muffin tin with batter, filling about ¾ of the way. I use an ice cream scoop. 6. Bake for 24 minutes, or until cooked through. Let cool at least 15 minutes before removing from the pan (the muffins will harden as they sit). Store in the fridge for 5 days, or the freezer for 3 months. *Egg replacement options: 1 tablespoon of chia seeds or flax seeds, ground. Mix the ground seed with 3 tablespoons of water (room temp or warm). Allow to sit for 5-10 minutes. It will turn into a gel. =1 egg. Double for this recipe. This soup is a meal in itself, and is an absolute family favorite! It makes a great big portion, which makes for healthy leftovers for the week. If you’re not into leftovers, freeze in single portions to use later. If you're not a quinoa fan, you can substitute any other whole grain, or leave it out all together. Whole grain pasta would work great! Leftovers are delicious as-is, thrown in a frittata, or even spooned over a few handfuls of mixed green salad. Enjoy! Heat oil in a large soup pot. Add the onion and leeks, and cook, stirring often, until they start to soften. Add the carrots and celery, and continue cooking, for about 5 minutes, stirring often. Add the garlic and cook for another 30 seconds, being careful not to let it burn. Add the tomato paste and stir well. Then add beans, quinoa, diced tomatoes, broth, thyme, and butternut squash. Add salt and pepper, to taste. Bring to a simmer and let cook uncovered for about 20-30 minutes, or until the squash is tender. Add the spinach and let cook for another 5-10 minutes. Taste and adjust seasonings if needed. Heat 2 teaspoons of the avocado oil in a large skillet over medium heat. Add onion and saute until translucent, about 7 minutes. Add mushrooms and peppers and saute for about 5 more minutes, or until desired tenderness. Place vegetables in a serving bowl. Toss the shrimp with remaining 2 teaspoons of avocado oil and the chile lime seasoning. Add to the same skillet used for the vegetables, over medium heat. Cook shrimp for 1-2 minutes per side. Warm taco shells or tortillas as the package suggests. Set up a taco station or build the tacos to serve. Serve with mango slaw, bean salad, guacamole or any other desired toppings. Enjoy! Whisk together the mayonnaise, Sriracha, lime juice, sugar and cilantro. 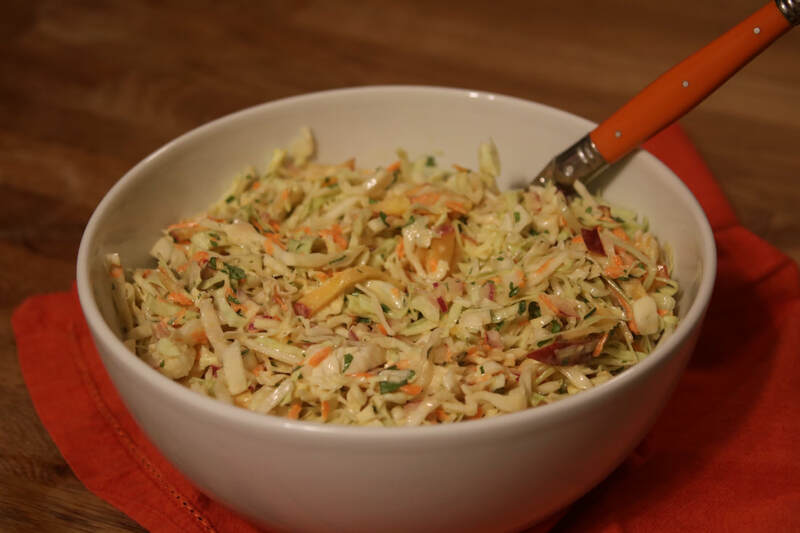 Toss with the coleslaw mix, additional cabbage, mango and red onion. ​​Suggested to make this at least a couple of hours before serving. The flavors get even better as it marinates! In a large bowl, whisk together the lime juice, vinegar, oil, paprika, salt and pepper. Refrigerate at least 20 minutes, but best if flavors are left to marinate longer. I usually prepare it the night before or the morning before the dinner party. Place all the ingredients in a small bowl. Stir until well combined. Adjust seasonings to taste. Enjoy immediately or refrigerate, storing in an airtight container.